The Friendship Shield was held at Beau Desert Golf Club on Monday 29th October 2018. The Shield is a competition held between 4 Golf clubs, Trentham, Beau, Walsall and Brocton Hall. The Junior Captain of each club plays together in a Stableford match; 4 pairs of CONGU players and 2 pairs of Red Tee Club handicappers play in a Stableford better ball format. Each of the teams points are added together and the winner of the shield is the team with the most points. This year’s winners were Beau Golf Club with Walsall the runners up. The day was a great success followed by a meal and presentation. 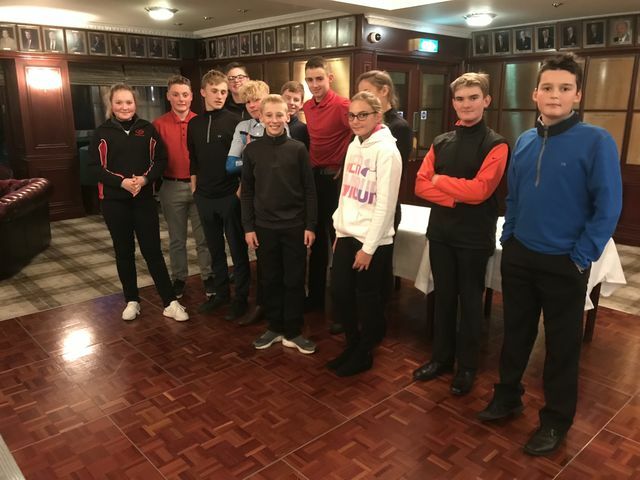 This was the first time some Brocton Juniors had played at another club so was a good experience to enhance their golfing knowledge. A big thank you to all the parents who travelled to Beau to give their support to our juniors. The Friendship Shield will be held at Walsall next year where we hope for a different result.